#DidYouKnow that you can now withdraw your money from your PayPal balance to your Kenyan Equity Bank account? Yes, You can. 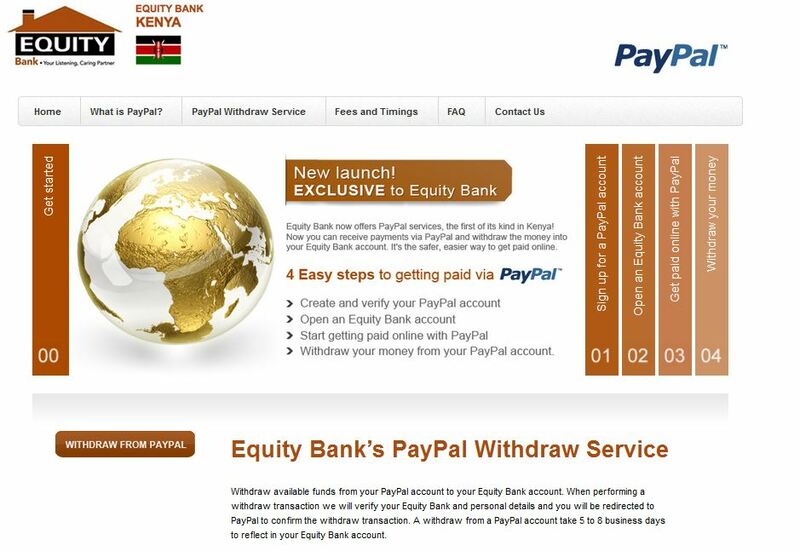 Well, to assist PayPal customers, like myself, to withdraw their funds from their PayPal account to your Kenyan bank account, PayPal, which also has an Android App available on the Google Play Store, has partnered with Equity Bank and created Equity Bank’s PayPal withdraw service. Open a personal or business account at Equity Bank. You’ll need to have the original and a copy of your ID, and to complete the account opening forms at a branch or agent near you. Start getting paid with PayPal, whether by selling goods and services or receiving money from friends and family overseas. Withdraw funds from PayPal via Equity Bank’s withdraw service website. For more information regarding the Equity Bank withdraw service with PayPal and how to link your PayPal account click, here. Funds take between 5-8 business days to reach your bank account where Equity Bank charges a small fee of the withdrawn fund amoun. Also, check on the currency conversion fees as they do apply.